A tea of tropical splendor. 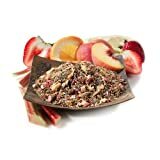 Soft Caribbean breezes inspired this fragrant red and green rooibos mix, conjuring up a paradise of peach pieces, strawberry bits and rhubarb. Ideal match of silky rose buds and soft marigold petals finish.